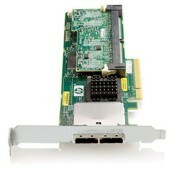 The HP Smart Array P212 is HP 's entry level PCI Express (PCIe) Serial Attached SCSI (SAS) RAID controller. The Low Profile Half Height card has 8 ports and utilizes DDR2-266 memory. The P212 is ideal for RAID 0/1 1+0 and can be upgraded with the 256MB battery-backed write cache (BBWC) module for RAID 5 5+0. Features include: Entry level performance reliable flexible and manageable.